More than 40% of children, under the age of five, living in the Western Cape, don’t have access to Early Childhood Development facilities. Learn more here. Donate (any amount) and together, we can change this! Click here to donate to our Starting Chance Projects! What is my Starting Chance donation worth? Our starting chance field worker has to catch a taxi to every school she visits. She does rotational visits to 5 schools on a 2 week schedule. The average cost per week is R300 and in time approximately 2 hours. A vehicle would greatly assist to make her more productive and available. ZAR 250,000.00 -- Build a Classroom for Lonwabo Special Care Centre. Lonwabo Special Care Centre near Cape Town serves a very large area. The principal’s dream is to see Lonwabo growing from a day-care into a Special Care Centre for children. Because there is no school for children with special care here, they are transported to other areas. Starting Chance is committed to the upskilling of the teachers and principals of the 9 schools that we support. 8 times a year we run a 3 hour professional development workshop for our principals and their head teachers. These workshops are practical and interactive and aim to support key areas of management in the ECD sector. We cover topics like governance and how to set it up in your school, budgets and financial record keeping, fund raising techniques and ideas to supplement your school’s income. At each workshop, the participants receive a practical pack, refreshments and notes. Bringing early childhood education into townships means transforming “care centres” in to effective pre-school learning environments. Most of the teachers we work with do not have formal training and many lack more than a basic education – but these amazing people do have passion for children and a desire to better themselves. Conventional theory-based training courses provided in tertiary colleges have limited success in practice. To overcome this Starting Chance provides experienced field workers to give one-on-one in-service training and coaching by role modelling best practice in the classroom. Monitoring and evaluation by highly experienced, independent assessors has shown that effective skills transfer is taking place and teaching is improving. Feedback from teachers trained in the Starting Chance programme underpins that field worker visits are imperative to success. We have also observed that as confidence grows, self-efficacy comes too, creating a lasting desire to continue to improve performance and self-development. Research has shown that teachers are more likely to retain and implement training if they do it themselves with support from an expert on the ground. Our field workers visit each of our schools and spend time role modelling best practice, supporting and mentoring the teachers. Our schools really value these visits and our field workers are in high demand. They normally spend 4 hours in the school from 8.30 – 12.30. The Starting Chance “shop” operates from the Starting Chance Resource Centre and has become an asset that is highly valued by principals and teachers. Café Together once a month allows this busy community of teachers to catch up with one another. Different teachers are specially invited each month to come along to share best practices and lessons learned with their colleagues. It is the highlight of the month – it is such fun to see teachers arriving with big smiles, shopping lists and bags. It encourages healthy competition, builds team spirit and most importantly has helped to improve the standard of teaching across all our schools. “The shop has helped my teachers to work together to earn more vouchers. 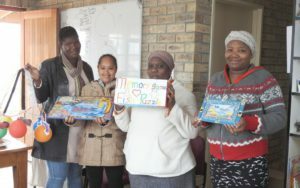 There is much better performance in the classroom.” Philiswa, principal of Blooming Stars. “When our teachers share best practice ideas at the “Café Together” and go shopping, they really feel good about themselves.” Noms, Starting Chance field worker. This is an incentive based best practice opportunity for our teachers. Teachers can earn tokens for best practice in the classroom, attending meetings and training, working as a team and showing initiative. At the café together they “trade” their vouchers for educational goodies from the shop. We need to stock the shop each month with educational games and toys, stationery, outdoor play equipment etc. 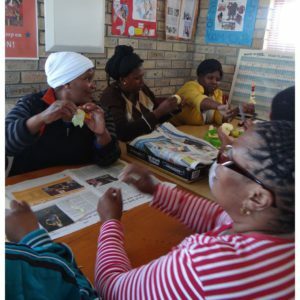 Each month we run open workshops for up to 25 schools on key ECD skills and topics. The 3 hour workshops are run on a Saturday morning. We cover topics like creative art, storytelling, music and movement. We consistently have between 30 and 50 teachers attending. We need to buy materials and refreshments for each workshop. The feedback from these workshops has been excellent – a teacher can come on a Saturday morning and implement the ideas in her classroom on Monday. Most of the shack/poor schools that attend our Saturday workshops have very little or no equipment in their schools. They cannot afford to buy equipment or games and educational play items. We like to give each school a take away pack linked to the workshop they have been on so that when they go to school on Monday, they have something to work with. We normally have 15 – 25 schools participating. Schools that regularly participate in our open workshops and register to attend all 8, get the benefit of a visit from the Starting Chance field worker to support and help them implement the training. These visits are really valuable as they aid the principal with her staff and elevate the level of education in the schools. As a registered Public Benefit Organisation under section 18A of the Income Tax Act, donations to Starting Chance are tax-deductible and we provide donation receipts.